Are you looking for a way to extend your living spaces? Or create the perfect place for outdoor entertainment? A stone patio is the perfect solution. At O’Grady’s Landscape, we’ve been designing and installing custom stone patios for homes throughout Northern Virginia since 1991. We can help you come up with a design to meet all your needs and match the surrounding landscape. To get a free estimate on your next project, give us a call at (703) 533-5001 or click here to contact us online. The intended use of your stone patio—will you be hosting summertime crab feasts? Or smaller sit-down dinners? Your stylistic preferences—your stone patio should reflect your personality and match the style of surrounding hardscapes and of your home exterior. The factors above can help you determine whether you want a Pennsylvania flagstone patio, or another type of material. We will provide you with a full range of options during your consultation. We offer stone patio installation to suit any need and aesthetic preference. You can choose a traditional, linear patio or a contemporary, freeform design—the option is yours! Once your design is finalized, we will proceed with stone patio installation using one of two methods. Dry set installation uses no mortar or concrete and is the preferred method for more casual patios, while concrete installation uses concrete slabs to produce grout lines and joints for a more formal style. If you expect heavy foot traffic, whether because you have kids or pets or you plan to entertain frequently, concrete installation also tends to be stronger and more stable. 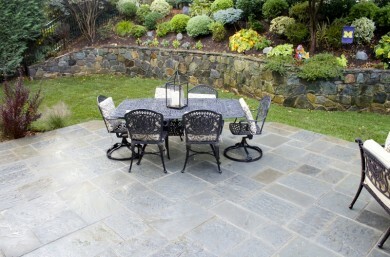 Why Choose O’Grady’s Landscape for Stone Patio Design and Installation in Northern Virginia? At O’Grady’s Landscape, stone patios are our specialty. If you are located in City of Falls Church, Great Falls, North Arlington, Vienna, or McLean and would like to get started on your design-build project, contact us today. We look forward to making your dream patio a reality!